You're shopping around for Fleet Maintenance Software and if you're a small fleet, you may getting outrageous quotes ranging upwards of $60,000+ for a basic Fleet Maintenance Software Program! 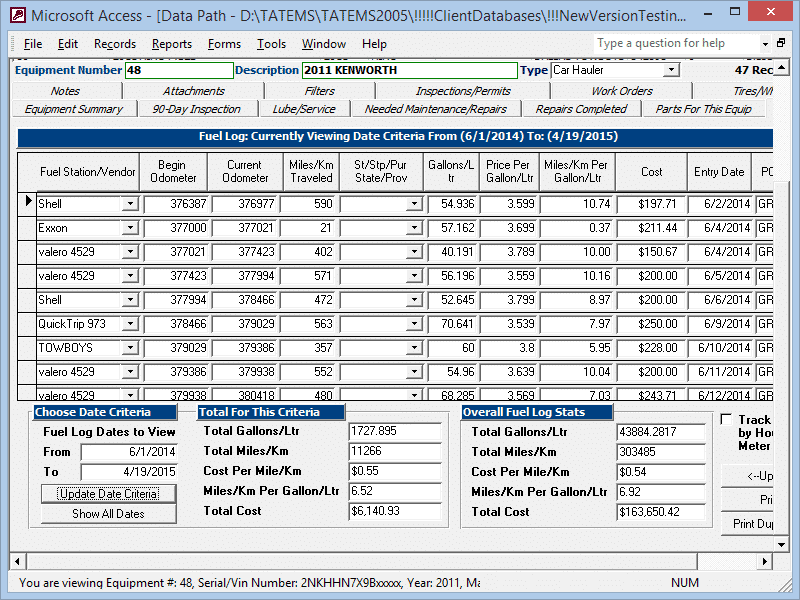 TATEMS is not some cheap, useless, quickly thrown together software either, we have invested literally, over 100,000 hours, in the development and maintaining of TATEMS equipment maintenance software over the last 21+ years, since it's first iteration in 1997. Has Staying On Top Of Your Fleet Maintenance and Repairs Become Overwhelming? Are you struggling with pencil and paper as you try to keep track of all the maintenance requirements of your fleet? Have You tried to move to computerized record keeping, by trying to use multiple spreadsheets? Do you need to keep track of the PM's and repairs, DOT or BIT type inspections, parts inventory, labor and parts costs of your fleet? Do you need to be able to provide your maintenance records to the government authorities? Are you at a point where you risk being shut-down if inspectors don't like the way you keep your maintenance records? 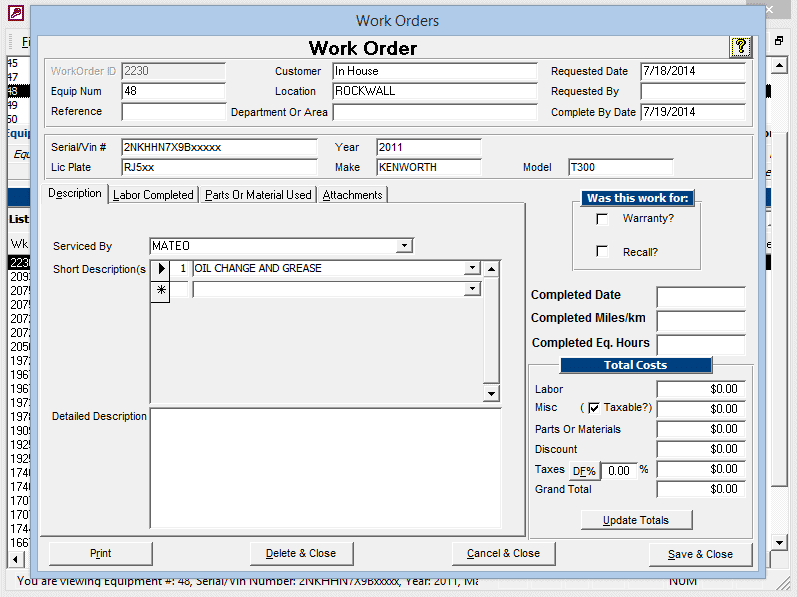 Would you like to have a simple system with on screen popup reminders and printouts? Have you called or maybe attended an online webinar for some other fleet maintenance software program only to discover prices as much as $60,000? TATEMS Truck Maintenance Software is not cloud based, It is installed on your stand alone PC's or Server's and can be networked so you can share your data between multiple users even during your free trial. Cloud services can be nice and we even have tried putting TATEMS in the cloud, but they can also be a nightmare. We have seen the stress caused by server outages that have lasted for a couple of days . It's not pretty and that is why we have discontinued the cloud service and do not offer it to new users. You however, can install TATEMS on your own Remote Desktop Services or Windows Cloud Servers if you prefer to work that way, and need the long range or multiple office connectivity it gives you. With TATEMS Truck and Trailer Equipment Maintenance System you are going to get a Fleet Management System that has been created and constantly improved since 1997. TATEMS was first created when the owner of a water well drilling company failed his California BIT inspection aka Biannual Inspection Of Terminal. In other parts of the country you may know it as a DOT inspection. The owner Chuck called us and basically told us he failed because his records were illegible and the CHP inspector could not read what was written. Chuck wanted a computerized version of the BIT inspection form and so we created for him. He would go on to use that first version to start tracking his fleet maintenance and inspections and passed his next inspection with flying colors. Good thing too... because if he failed again they were going to shut him down. We have since had many CHP and DOT inspectors recommend TATEMS to the fleets they inspect because it makes their job easier too! And You Are Going to Get Amazing Friendly and Helpful Support via Phone, Email, Live Chat and Remote Support Sessions. We have over 2500 fleets currently using TATEMS, and each fleet uses TATEMS to help them maintain anywhere from 10 to 1000 pieces of equipment. So you're not on the front lines of trying something untested and going where no one has gone before. If you average that out to a conservative 100 pieces of equipment per fleet you are talking about over a quarter of a million pieces of equipment being maintained with TATEMS Fleet Maintenance Software. Download your Free Trial today and we will even import your equipment list for you for free, even during your free trail and there is no obligation whatsoever for you to buy. 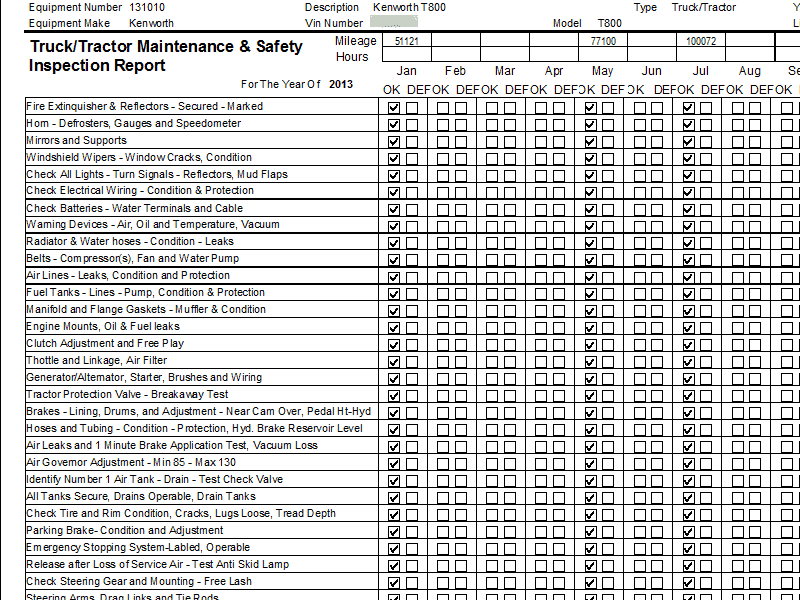 Below is a small sample of what TATEMS Fleet Maintenance Software gives you... and helps you with. You get the abiliy to create work orders that deduct parts from inventory and also tracks labor labot costs for detailed cost tracking. 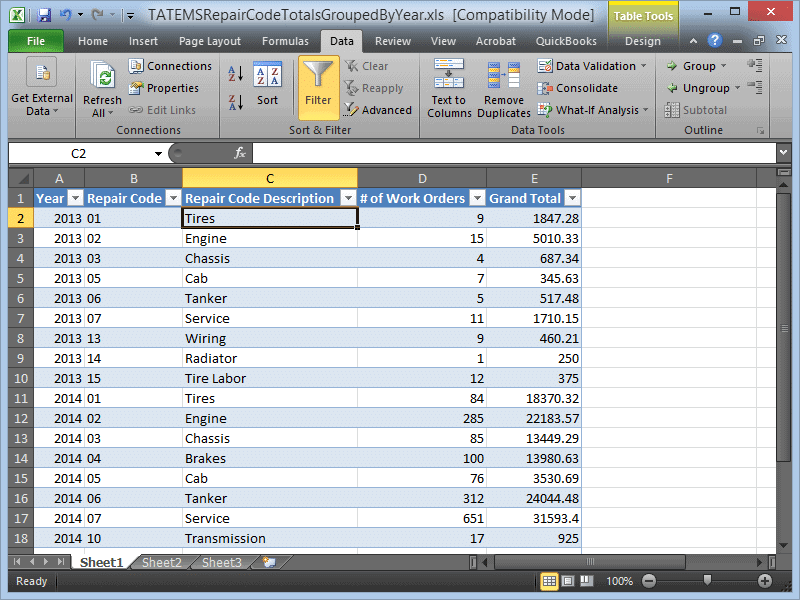 You can also assign repair code categories so you can see what you are spending on each category of repair or maintenance. You can create, track and get reminders for Lube/Services based on Miles/Kilometers, or Hours Meter, or Days intervals. Plus Reminders to let you know when they are coming due. You get a fuel log that lets you track by miles/km or by hours meter. 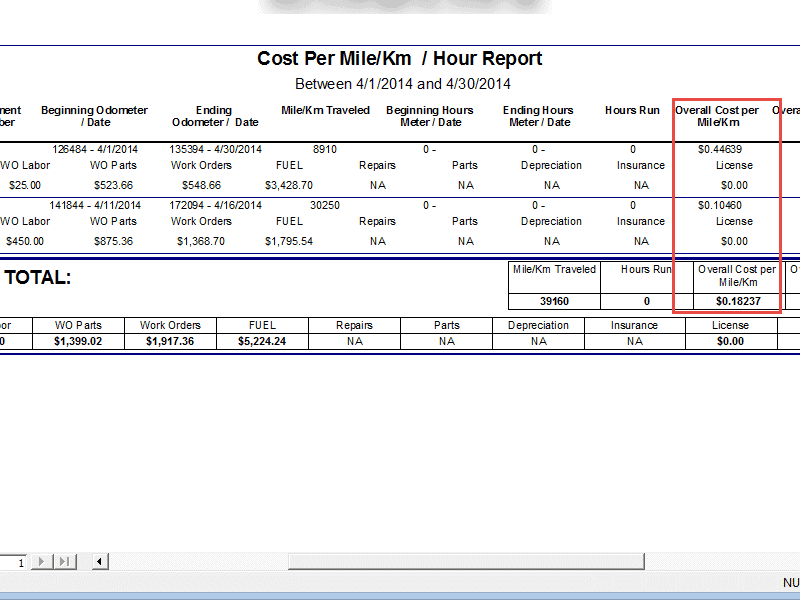 Plus you can track and report on miles/km traveled and fuel purchased within States or Provinces. You Get Inspection check lists for your 90 Day (or user defined number of days) Truck And Trailer Maintenance and Safety Inspections. Plus reminders to let you know when they are comming due. 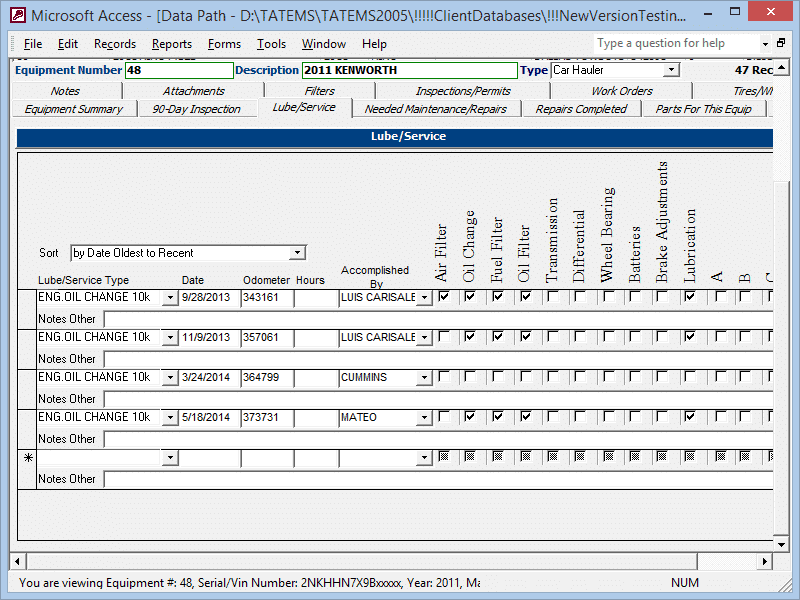 You get a basic and simple parts inventory that shows you what was installed where and when. It will also let you know when you are getting low on particular parts. 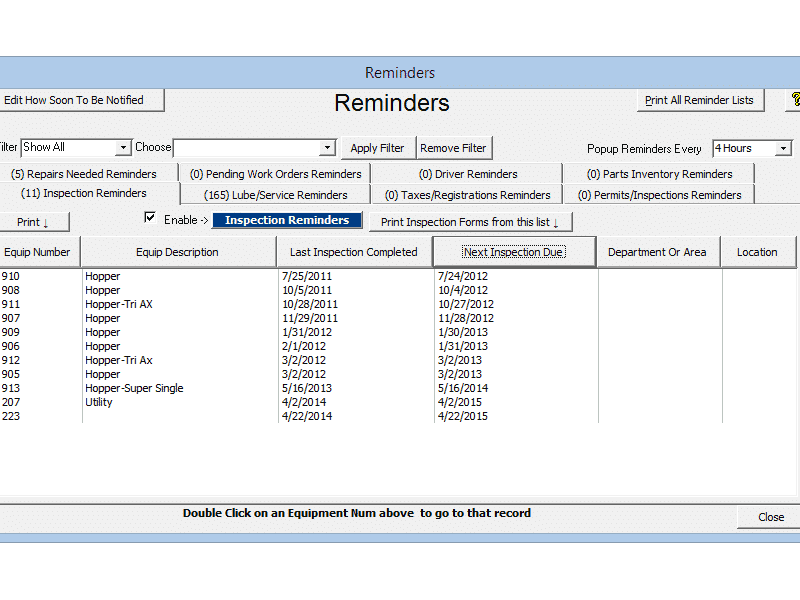 You get reminder popups that are printable for Lube/Services, 90 Day Inspections, Pending Work Orders, Permits/Inspections, Needed Repairs, Taxes and Registration, Parts Inventory, Drivers License Renewals and Driver Physicals. TATEMS is easy to get started with and organized in a way that helps non computer users to be able to input data and get reports, with ease. The reminders and reports help keep up with those items that are likely to slip between the cracks. I hate computers but I love TATEMS. It has made the tracking of my maintenance quick, easy and accurate. TATEMS support is awesome! They respond quickly and help with all issues including my inability to follow simple instructions posted in the news letters. I would recommend TATEMS to all. Tatems has given us the ability to track 90 day BIT inspections, cost analysis on each piece of our equipment, fuel and mileage analysis on each vehicle. TATEMS is EASY to use and has excellent training videos. We just had our CHP inspection and passed easily. It was wonderful not having to worry about the maintenance of the vehicles. We have used TATEMS for about a year and we are very pleased with the performance, price and ease of the software. The service department is quick, friendly and very helpful. I would definitely do business with TATEMS again. I have already recommended the software to several friends. We use Tatems to track bits and dots and smoke tests for fleet maintenance. When I came on as Office Manager the owner was depending on his memory and time-consuming searches to know what units were due inspections. Also, the exact due-date of the inspections could be off unless we pulled the paper inspection from our files. 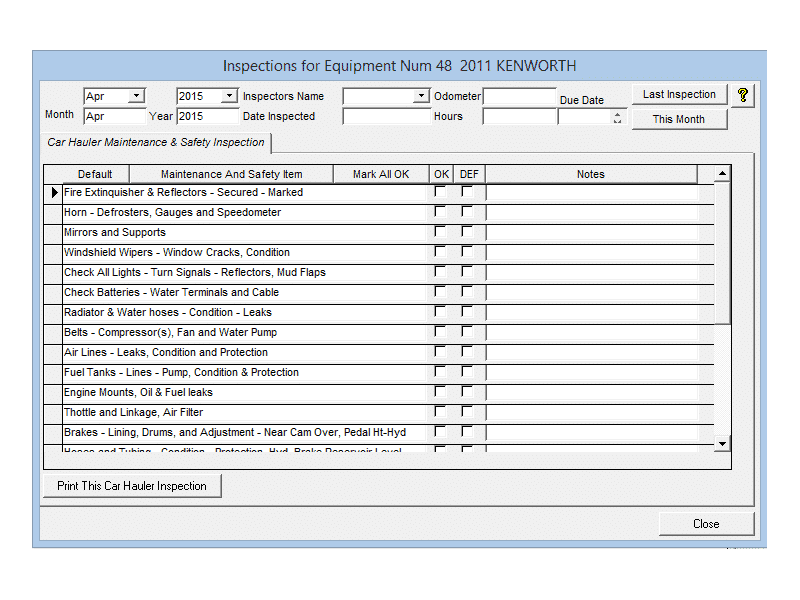 Now I print reports each week showing us what units need inspections within whatever time-frame I select. We track about 30 companies, some with 5 units and some with 30+. We currently have about 1,100 units tracked in Tatems. When initially searching for a stand-alone program, Tatems beat others by its simplicity, its affordability and its flexibility. Since purchasing the software they have responded quickly whenever I needed help in using it. After awhile you actually know the folks by name. 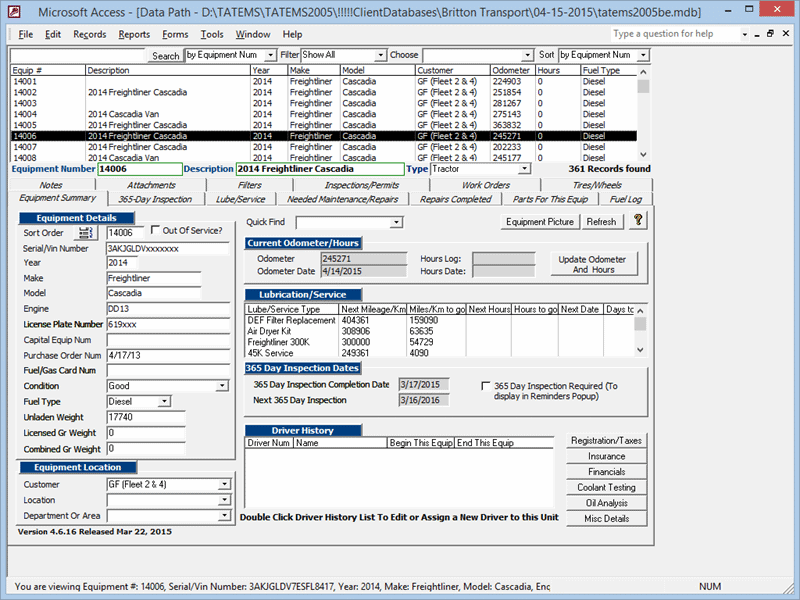 You get a 14 Day Trial so You can Try TATEMS Fleet Maintenance Software out Before you Buy. Go Ahead and Enter All the Data you Want. FREE BONUS During Your Free Trial... You can have us import Your Equipment List for Zero Cost to Save You Time. If You decide to buy you can continue with all the data you have entered. You do not loose anything.